I love Christmas, in fact it is my favorite holiday, and not because of presents and cookies (although those don't really hurt any). I love the music (well, the sacred music more than the silly, inane pop songs), the feeling of the season, and giving gifts. That said, I don't like Christmas before Thanksgiving, before Advent starts. The season has its place, and by not starting too early, I can stand the decorations, songs and whatnot for the entire season. Retailers, however, do not seem to see things my way. The Wegman's that we shop at has had fake Christmas trees on sale for several weeks. Today, Halloween, when I went to get some candy for tonight, I was lucky to find any - most of it had been removed in favor of Christmas candy. Honestly, can't they wait one more day, at least, so that it is November? And then I found this article in the NYTimes about how WalMart is going to jump-start the season by having its first big sale this weekend, instead of waiting until the day after Thanksgiving. C'mon! This is just encouraging rampant consumerism and obscuring any redeeming values of the season. Even if you aren't religious, Christmas ought to be about peace on earth and goodwill toward men, not shopping 'til you are so in debt you are in danger of losing your house! Good grief! Tomorrow is November already, and Thanksgiving is only 3 weeks away! We are prepared for trick-or-treaters, and are likely to get more than we ever did in Austin (which was none - although I would have thought apartments would be prime pickings). Too bad, because left-over candy is as close to trick-or-treating as I am likely to get until I have children. Dad, dressed in a frightful old man mask, was usually the one who went with me when I would go ... Ah well, maybe there will still be some candy on sale when I go grocery shopping this weekend. I have finished my first knitting project, although I hesitate to give it such a grand name. I didn't really make it into anything, and it is too short to be a proper scarf, and too narrow to be a place mat or cat mat. Oh well. Next up I am going to try a real scarf. But, that is about all I am up to at the moment, which is a shame, since there are so many interesting yarns at the store, and Benjamin and I only need so many scarves. Well, you may all be getting scarves as Christmas gifts, ha ha! I put out a suet feeder this morning, now that it is cold, and I already have a new bird: a downy woodpecker! Wahoo! 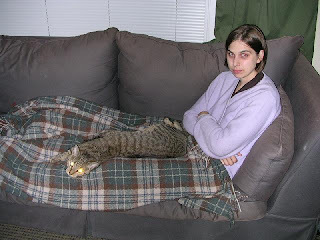 Back from my trip across the state to visit with Catherine and Morrie. Apart from the rain that washed out our planned hike on Saturday (and then stopped just when it was too late to go), everything went well. The drive allowed me to see more of my new state, and the foliage. There were friends, good food, and a wriggly puppy - what more do you need for a weekend break? Saratoga Springs, where we spent Saturday and Sunday, was pretty, and warrants further investigation (preferably not in the driving rain! ), as does Albany. I only got to see a bit of the downtown area of the latter during a nighttime walk, and would like to go back in the daylight to do some exploring. Fodder for future adventures! Thanks again to Catherine and Morrie for putting me up and showing me around! No, I haven't joined the state government. I am going to visit Catherine and Morrie (who do have some sort of government jobs) and do some sight seeing. This trip is by myself, since Benjamin has opted to be a good professor and stay home to work. Still knitting. I am not sure what I am making at the moment. It is too wide to be a scarf, and too small to be a blanket (since I only have one skein of yarn in that color). Maybe a kitty place mat. Cleo is certainly interested in my new hobby - she sits in my lap while I am trying to knit and attacks the yarn when I pull on it. Oliver just observes. If I had doubted the coming of fall, I do so no longer! I spent two hours today raking leaves. 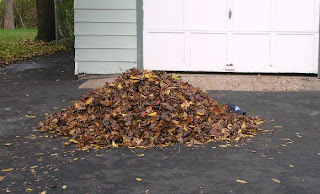 This is a picture of the leaves I raked up in the driveway. You can get a sense of the size by the baseball hat on the right. It is only a three day accumulation, since I raked it clean on Sunday afternoon. I also raked the backyard, or at least some of it. It took 5 wheelbarrow loads to clean up that pile, and another three for the back lawn piles. Whew! I love the smell of drying leaves - sort of crisp, sweet - sort of indescribable. I haven't smelled it in years though, because the leaves on the live oak trees (the majority tree in Austin) don't fall in Autumn, and they don't smell like maples. 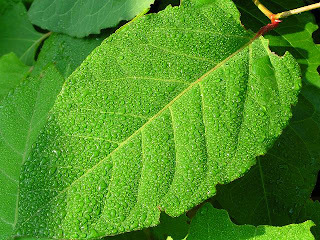 When we went to Ithaca the other week, I mentioned the smell, and Benjamin said that he had never smelled it at all - that's what comes of growing up in an area with no deciduous trees! That smell of maple leaves transports me back to childhood, and fun of "helping" my parents clean up the yard. 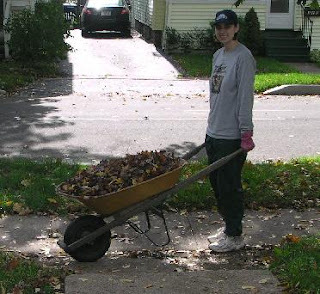 Dad would load up the wheelbarrow with leaves, and I would ride on top back to the compost pile. Grass clippings were another good cushion in the wheelbarrow, but a bit messier, since they g ot all over and in all your clothes. 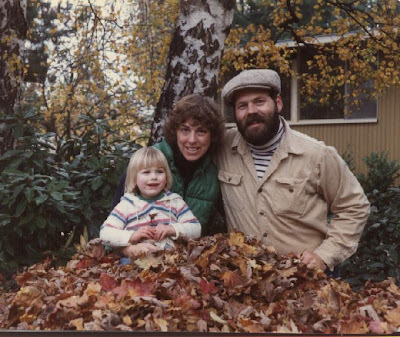 One of my favorite family pictures is one we used for a Christmas picture one year, posed behind a giant pile of leaves. In a strange turn of weather events yesterday, Brockport experienced another summer-like day, while Austin had a typical Brockport fall day. We had sun and warm temperatures, Austin had cold and rain. Very strange indeed. Today we are supposed to have more typical, seasonable weather, but so far, even with the rain and cooler weather that arrived over night, we are still warmer than Austin, according to the various weather web sites I have consulted. In fact, we have been having such nice weather this autumn that I find it hard to believe the scary winter weather stories that people have been telling me. 95 inches of snow?! Temperatures hovering around freezing or below for weeks? C'mon, tell the truth. No, no, I know (intellectually) that winter will indeed come, and when it does it will last for months, but with these balmy days and nights, it is just too hard for my (non-intellectual) mind to grasp. I am sure I am in for a rude awakening one of these mornings! Yesterday I went to pick apples for possibly the last time this year. We shall see - there weren't many apples left at the farm I went to, but another farm may have more longer. It is certainly Fall now. Most of the trees are turning, all of a sudden it seems - at least, I didn't notice the day that they went from being mostly green to being different colors. And the leaves are most certainly falling. Several of the trees in the neighbor's yard are bare. I raked the driveway yesterday, and thanks to the wind, it was covered again within a couple of hours. Yahoo! Another Friday. Not that we have any exciting plans for this weekend, and not that my weekends are particularly different from my weeks. But, they are still nice. Tonight we are going to go see a student play at the college. I'll try to remember to give a review tomorrow. Have a good weekend y'all! If we make any other good soups, I will be sure to let you know. After reading my post for yesterday, Benjamin pointed out that if there were only half as many people on the planet, everyone could live like us (needing two Earths). He did not have any practical solution (apart from global pandemic) for how to reduce the population, favoring the idea that everyone have only one child per family. Since I don't think the pandemic is realistic (or desirable), and I think it will be awfully hard to get everyone on Earth to agree not to over procreate, we will just have to work on other ways of saving our planet. On a more basic level, don't use plastic shopping bags. Canvas or other reusable bags are available in most grocery stores for very little these days, and if you get one or two, stick them in a dark closet and they will multiply like rabbits. It's true - we started out with just a couple and now have 10 or 11...If you use the plastic bags for trash or animal waste, you can get a few, but do you really need the hundreds that come from one shopping trip? Replace all your lights with compact fluorescent light bulbs. These do need to be specially recycled when they burn out, but they don't burn out for a very long time. You can get the equivalent amount of light as a 100 watt bulb, for only 15 watts! Recycle. Everything you can. Try freecycling - this is where you trade or give away items you don't want to people who agree to use them, repair the items, whatever. Google the term for more information. Feel free to add your own ideas in the comments section! Blogger, the service I use to create this blog, encouraged its members to post about environmental matters on Monday. I missed it, but figure that better late than never. So here goes. How green are you? Consumer Consequences, an interactive web site sponsored by American Public Media, has a quiz that you can use to find out how many Earths we would need if everyone lived like you. Benjamin and I consciously try to have as little an impact as is possible and practical - buying as much local food as possible, recycling, not buying disposable products - but due to the general American way of life, even we would require 2 Earths. This is appalling to me. Some of it we just can't do anything about right now, because we don't have enough money to completely change, and we are not given options by the people running our utilities, cities, car manufacturers... If we all get involved and tell these people that we are not happy with our choices, maybe we could make a difference. Nothing will happen if we don't speak up and act out. To quote Wayne Gretzky, "You miss 100% of the shots you don't take." Of course, one of the problems with getting more people interested in saving the environment is that there are so many of them just trying to survive. It is awfully hard to worry about how sustainable your food is when you can barely afford any to begin with. Thomas Friedman's column in the New York Times today points out someone who is trying to tackle both problems at once. I hope more programs like this can be put together, but it is going to take action at the grass roots level, not the government level, by the people who are directly affected. Get involved! We had a very nice trip to Ithaca this weekend. A big thanks to Hilary for providing us with a place to stay and for giving us an insider's tour of Cornell! On our way down we stopped in Seneca Falls at the Women's Rights National Historical Park. This was unscheduled, but worth the detour. 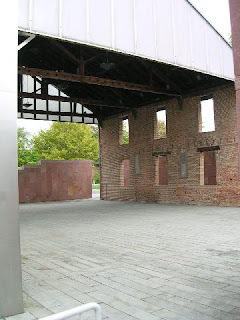 The Visitor's Center is next to the Wesleyan Chapel that hosted the First Women's Rights Convention in 1848, and the commemorative waterfall monument. Inside, there are life size statues of some of the leaders, including Elizabeth Cady Stanton and Frederick Douglass - I was taller than everybody except him, and just about the same as him. People sure were short in the mid-1800s! I am sorry to inform all the oenophiles among my readership that we did not stop at any of the many wineries on the Cayuga Wine Trail. Since neither of us drink much wine, the only one that tempted us was the hard cider store, but we put that off for another trip. The drive along the lake itself was nice and scenic. The leaves are still a week or two away from full turning (the paper this morning pointed out that this is because of the warm, dry summer) but there were enough to make the trees look autumnal. We got really lucky with the weather - although it was a wee bit nippy, the sun was out for the first time all week. 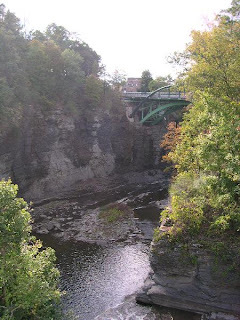 On our tour with Hilary we got to see the famous gorges and bridges of Ithaca, including the Bridge of Death from The Fool on the Hill, which we now have to re-read, so we can put the places together in our minds. 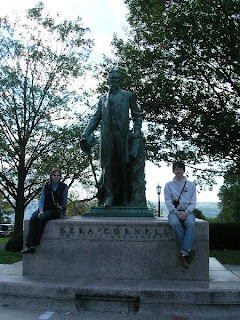 And we got to have our picture taken with Ezra Cornell! 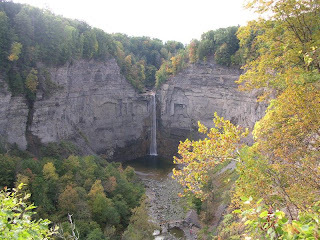 On our way home we stopped for a hike in Taughannock Falls State Park. The falls are the one of the tallest east of the Rockies. The mixed colors of the trees and the rocks were really spectacular. There wasn't a lot of water coming down - drought strikes again - but spring snow melt is supposed to be really something, and I would believe it. You probably can't tell in the picture above, because it is so small, but there are people at the bottom of the picture which might give you a sense of its height. Anyway, we had a good time. I really liked Ithaca and the surrounding region - much more scenic than flat old Brockport, that's for sure! We will probably try to go back in the spring or early summer to do some more exploring. Why do the baggers at Wegman's continually flout proper banana bagging etiquette? The last few times I have purchased bananas, the checker put them in a bag first, and then proceeded to fill the bag with cans and other heavy goods. Why did these people not put the bananas on the top of the bag filled with fluffy and non-bruising produce? Today I took the bananas out of the bag after the checker's back was turned. Next time, I am going to demand that my bananas get the respect they deserve as a soft, easily damaged fruit! We're off for a (short) adventure to Ithaca. On the itinerary: leaf peeping, touring Cornell, eating at the Moosewood Cafe, maybe visiting a farmer's market, and going for a short hike. We will take pictures, but I won't promise anything will be posted until Monday. And fall is definitely here. We went from having temperatures above average to having temperatures below average today. Huh. I'm getting what I asked for! Taco Bell is opening stores in Mexico. This is one of the stupidest things I have heard today. As one person quoted in the this article said: "It is like bringing ice to the Arctic." Yeah, nasty, contaminated ice. Taco Bell is so far removed from anything resembling Mexican food...I hope that Mexicans refuse to fall for such a money grubbing ploy and stick to their own real food. Yesterday I had two new recipes, and they were both good. One was my own invention (if you can call it that, and I am sure it was not really all that original, but it was new to me), and one was out of the new Moosewood Cookbook I bought last week. The first was warm applesauce with strawberries and honey. I made a batch of applesauce over the weekend with the apples Benjamin and I picked - it is pretty good on its own, but yesterday for breakfast I wanted something a bit different. So, I defrosted a few frozen strawberries, chopped them up, added applesauce and honey, and microwaved it for a minutes. It was absolutely fab. Dinner was a butternut squash and bean soup. I wasn't sure if I would actually like it, since some butternut squash recipes end up too sweet, but this one was great - it had a nice balance of tastes, including tomatoes, oregano and garlic. It was very good with a salad and homemade bread on the side. I would have made foccacia if I hadn't just made bread on Monday. Maybe next time. Anyway, if you want the soup recipe, let me know and I can send it on. As a general rule, I avoid discussions of politics and religion because they tend to go badly. Either I disagree with the person I am conversing with, which only makes me think less highly of them and their intelligence - and I am misanthropic enough without any encouragement, or I agree with them and get tired of agreeing and rehashing grievances. Occasionally I can have a measured discussion, but this isn't common. Besides, my philosophy is that my beliefs on religion and politics are my business, not anyone else's, and most people probably do not want to hear me talk about them. That said, I get extremely tired of people who claim that the United States is a Christian nation, and all that "God Bless America" rhetoric. I do not like that my religion is co-opted and twisted to serve political purposes. At the time this country was founded, almost everyone would have been considered a Christian, whether they believed in it or not. Thomas Jefferson is often described as a Christian, but he re-wrote the Bible to remove all the bits he didn't like. Don't believe me? Here is a modern reprint of it. This tendency to pull out the rhetoric is especially bad in election years (which this technically is not, but try telling that to all the presidential candidates...). All of this lead up is simply so I can recommend this op-ed article from the New York Times. It is, and has been for several days, at the top of the list of emailed and blogged articles. Read it. Give it to your conservative friends. According to the weather forecasts in the paper and on the radio, our extended summer will be ending this week. Today is supposed to be in the 80s and humid, but by the end of the week, it is supposed to be only around 60, if we are lucky. Sounds good to me. I am ready for cold (although, considering that winter can last until April here, maybe I shouldn't be so eager). I haven't seen the woodchuck in a week or so - can he be hibernating already? Probably not, but he will be soon. The Canada Geese are leaving in large groups, so maybe they know something. The gold finches that I saw at my feeder in August and September also seem to have disappeared, to be replaced by chickadees and sparrows. The cardinals and blue jays are supposedly the only birds that stay all year. We'll see. Anyway, I am going to take advantage of today's weather and will be spending time in the yard - raking up some of the first leaves of the season and planting the bulbs that I bought. The major drop of leaves hasn't really started, but our driveway is covered. Most of our neighbors seem to use a leaf blower several days a week to remove every leaf - or at least to blow them into the road, where they just collect in the gutters. Ugh. I know they can save time, but I can't stand noisy power tools, and I don't see that a few leaves on the drive hurts anyone. The bulbs are a mix of tulips, daffodils and hyacinths. I just hope the squirrels don't dig them all up, looking for the wild walnuts and horse chestnuts that they have buried. The baking continues today also. I have a loaf of sourdough rising on the stove, and plan to bake that crostata. Several people have suggested Benjamin take some of the baked goods to his office to share with co-workers, but that will definitely not be happing with the crostata! Luckily, it isn't really large so we can eat the entire thing, and once in a while can't hurt, right? Just to be on the safe side, I am heading out for a bike ride first. That's how many we picked today, on top of the 6 pounds I picked the other day... I've already made a batch of applesauce, and will be making an apple crostata tomorrow. I know, I said I would be cutting down on the baking, but Benjamin practically told me to! And who am I to disobey my husband (hee hee). 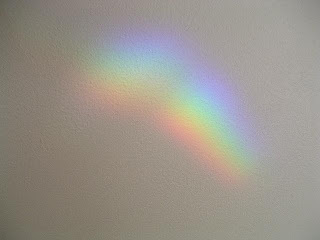 We have rainbows on our walls, thanks to a set of prisms on the windows. Mom gave me the prisms in a Christmas stocking a year or two ago, but until we moved into the house, I had nowhere to put them, since all of our windows faced one direction, and none of them got the right kind of light. Now, there are 4 prisms in the front windows that get morning light, and one in the bedroom. Like rain-caused rainbows, these are fleeting - they only last as long as the sun is coming from a certain direction (of course) but they are nice while they last. And they always come back. I succumbed to temptation yesterday at the bookstore and bought a new cookbook - Moosewood Restaurant New Classics. Not a baking cookbook, although there are some baking recipes in it. It does have a very simple applesauce recipe (not that applesauce is hard in any recipe) that I am considering for this afternoon or weekend...Mmm. According to my parents, there was a time when I was a toddler when I would only eat applesauce and yogurt. Add a good loaf of bread and a cup of tea, and it still sounds like a good meal to me! 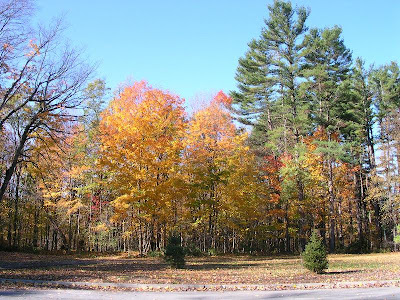 Although you would be hard pressed to determine the season by the weather - we are in the middle of a lovely stretch of warm weather -, it is Fall. And Fall means it is time to collect horse chestnuts. When I was very small, my parents and I would take annual trips to Volunteer Park in Seattle and fill great baskets full of the chestnuts (which are NOT edible, by the way). When I went away to college in Walla Walla and rediscovered them, I was so excited that I brought a large paper bag full when I came home on break. They are lovely and smooth, and somehow soothing to hold in your hand in your pocket as you walk around - sort of like those stress balls you are supposed to twirl around in your palm. They signify Fall, and I have missed them in Austin over the last six years. (Of course, Fall in general is something that I missed in Austin. 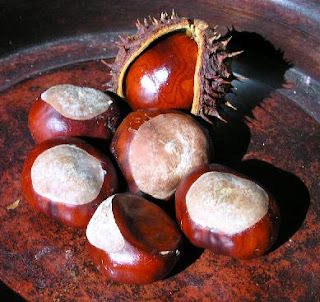 Although October and November can be nice enough, no one who actually knows what Fall is like would describe Austin as having one...) Anyway, there are two horse chestnut trees on our street now, and I have started picking them up again. Autumn (to change my term for the time of year) is a good time to take an early morning walk. The dew on the plants makes for interesting pictures (ask my dad, he had several slide trays full of dew drop pictures at one point). I took this one today. The morning was foggy, although most of the fog had burned off by the time I got out of the house (OK, so it wasn't that early of a morning walk, but the dew hadn't dried yet!). I know it would be more impressive in a bigger picture, but I don't really want to take up all my storage space. If you want a larger copy, let me know. If there is such a thing, I think I should join. A support group that I could call whenever I feel like baking too much...I love baking desserts, breads, cookies. It is apple season, which means apple pie, apple bread, apple muffins. 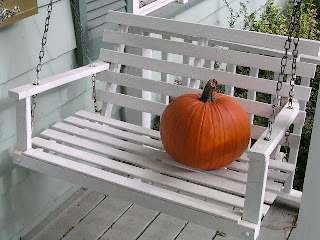 Soon it will be pumpkin time, which means pumpkin muffins, pumpkin pie, pumpkin bread, pumpkin cheesecake. It is always cookie time - chocolate chip, snickerdoodles, ginger snaps, sugar cookies with icing. And there is are all sorts of miscellaneous baked goods like spice cake, pound cake, gingerbread, and breads of all kinds. I want to make them all! What is wrong with being a profligate baker you ask? For me, it is the fact that there are only two people in our house, and when I bake something, we have to eat it, all of it. Neither of us need the extra calories and fat that come from eating an entire cheesecake, nor do either of us really want to eat that much. And baking that much is expensive! Have you seen the price of good butter these days? What I need is a family of 10 to eat everything, or a small cafe! (Just after I typed this, I heard this story on NPR about professionals trading their jobs to become bakers.) No Mom, I can hear your thought right now, and am not going to open one. I will just have to continue to hold myself back, unless y'all want to come visit - then I will have an excuse! Go read a banned book! Remember, if you do not use your rights, they are likely to disappear! The rhetoric surrounding climate change is far too often unhelpful and unproductive. We are all going to be affected by it, whether you believe humans have caused it or not. This editorial by Vaclav Havel in The New York Times is the sort of moderate, reasoned voice that we need to hear more of in the debates and attempts to find solutions. 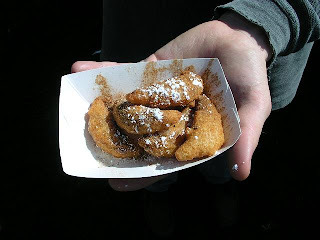 On Saturday, we took a trip to the Hilton Apple Fest! 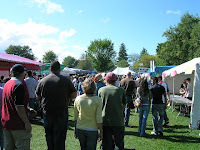 Apples are a big deal here, and the local paper said that 70,000 people were expected over the two days of the festival. As you can see from the pictures, the weather was perfect - sunny, mid-70s. And I don't know about 70,000, but there were a LOT of people there - we kept almost getting trampled by mothers pushing 4-wheel drive strollers. When we arrived, we were able to get a parking spot without too much trouble; when we left, the line of cars heading into town was probably 1/2 a mile long, and we were at the very end of that - who knows how far it went the other direction. The crafts leaned heavily on the side of harvest kitsch - scarecrows, pumpkins, corn stalks, witches - that sort of thing. The bird houses and thermometers painted in the colors of local sports teams also appeared to be popular. There was one booth with really neat beeswax Christmas ornaments. Watch out if you got in the way of a local matron who had her eye on one of the booths... The only thing that tempted me were a couple of hand carved rolling pins made of cherry and kona woods, respectively. Alas, I had not brought the checkbook, so I had to pass. We also passed on the apple fishing booth. Apparently, bobbing for apples is out - not hygienic I guess - so the kids got to fish for the apples using a big net/scoop thing. Too easy! I think it would more fun if they had to use a real fly rod or something. All in all, it was a fun fall afternoon diversion.